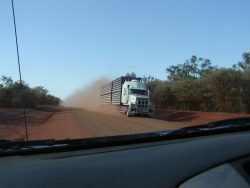 We left Trilby and travelled nearly 400kms, in red bulldust again, until we arrived at a very small town, having a much welcome caravan park. The temperatures are cooler still and we have jumpers on for the first time since leaving central NSW on the way up. On the road again the next day, finding the distances between towns much smaller than in Queensland. 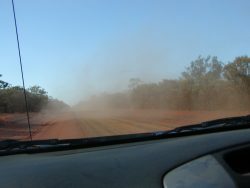 Another 100kms on red dust, where I photographed an oncoming road train, although the photo doesn’t really represent the foreboding giant approaching and the overpowering dust that follows. Happily, the next 350kms or so were on bitumen – I think we are both thoroughly over red dust roads. Our supposedly “dust proof” caravan is covered in red dust internally and we are leaving every skerrick there to show the dealer, who will have his work cut out to make sure the caravan lives up to its guarantee of being dustproof! We take it back next Monday, on our way home. 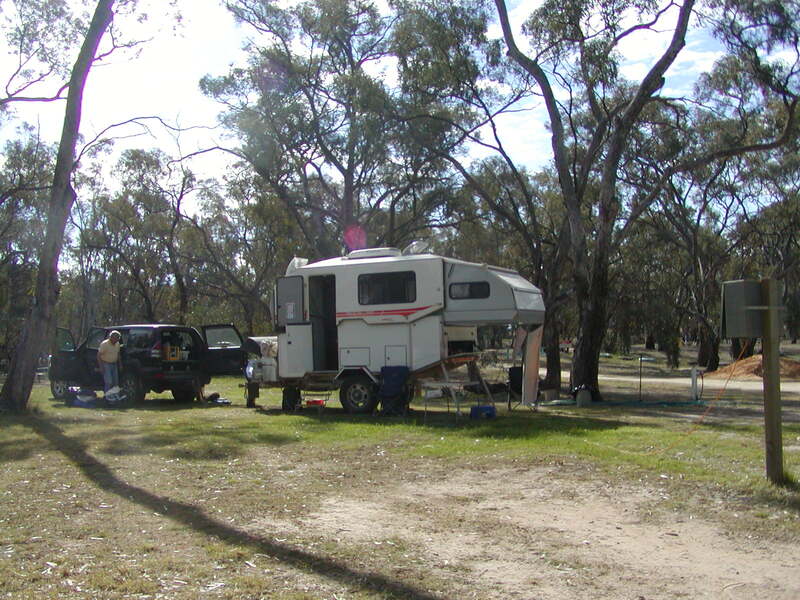 Our destination today was Echuca, but we saw a sign to Four Post Camp, just south of Deniliquin. Advertised as being on the Edward River, we thought it was worth a look. It turned out to be a great diversion, although the river is a shadow of its former self. We found out that the Edward River is an anabranch of the mighty Murray River, and when it’s in flood, it actually carries more water than the Murray! Fires are allowed here and we had the caretakers and two other campers as company. The caretakers are volunteers here, and the whole camp was originally set up as a recreational site for children. Schools, aboriginal groups, children with special needs are a few of the beneficiaries, and the camp is open to groups for conferences, as well as people like us – just needing a powered site for a couple of nights. It’s like a massive Mahaika (? ), with a children’s activity area, a large hall, a new bunk house, with very good accommodation, BBQs, etc. Funding has come from the Federal Government, as well as the local Lions and Apex Clubs. We have just clocked up 10,000kms, at a cost of $2,000 for fuel. Broken Hill has more trucks and sets of traffic lights underground on mining roads than it does on the surface. Broken Hill is also further from its own state capital Sydney, than Melbourne or Adelaide. Hillston, Willandra and the surrounding region contain a system of Pleistocene lakes, formed over the last two million years. Ancient fossils, burial and cremation sites have been discovered in Willandra Lakes, dating back 40,000 years. Tibooburra is bordered by the Sturt National Park, named after explorer Charles Sturt, who passed through the area as he searched for an inland sea in 1884-85. It is claimed the cash flow at Lightning Ridge’s Commonwealth Bank is the largest in Australia. Wentworth’s prime position at the meeting place of the Murray and Darling Rivers saw it short listed to become Australia’s capital. Sturt described the point at which Wentworth now lays as the ‘confluence’ – the merging of two streams. Did you also know that this is our last blog (sob, sob), as tomorrow we go to Kyneton, meet up with Barry and Cas, have lunch on Sunday in Woodend and see Samantha’s new house, then the dealer on Monday and HOME. Look forward to catching up with you all!! Thank you for reading – hope there haven’t been too many mistakes!! !